In our studies of the zodiac and eurythmy, we have now reached the signs that rule the winter. When the sun traverses its low path across the sky in Capricorn, the trees are bare of leaves, the temperatures are cold, and the ground is often frozen hard, even covered with snow. Through the help of the earth elemental beings, the Earth Mother is harboring the seeds safe underground. Spiritual science directs our vision to consider that it is exactly in this season when the forces beneath the surface of the earth are most active. Capricorn, the tenth sign of the zodiac, is a cardinal Earth sign. This is the season to contemplate the death of winter, and the birth of the Christ child as a seed of light in the darkness. In the season of Capricorn, we may also pause to remember the myth of Persephone, daughter of Demeter, the goddess of the harvest. Persephone, the goddess of spring, was kidnapped by Hades, god of the underworld, and carried off to be his bride. Filled with grief, her mother Demeter no longer allowed the earth to bring forth crops. At length, Zeus instructed Hades to release Persephone. He complied, but because he had tricked her into eating food while she was with him in the underworld, she was compelled to return to live in the dark for six months each year. The layers of this story are myriad, but they present a mythological picture of what happens in winter, when the forces of spiritual life are active in the depths of the earth. Persephone’s banishment to the underworld represents to us the cosmic forces that are captured and held by the earth throughout the winter months. Contemplating her life-giving presence in the realm of death, we are given a clue to the forces of life that overcome death in the natural world. Capricorn rules the season in which Persephone is the bride of death, when life succumbs to death in the natural world. In this spirit, the celebrations of the winter solstice and of Christmas fall within the seasons of Sagittarius and Capricorn. The sacred Christmas festival directs us to contemplate the infinitely tender child of the universe born in the manger, recognized and worshiped by both simple shepherds and wise kings, representing the twin paths of love and of knowledge. Capricorn thus instructs us to consider this great mystery of birth, death and rebirth for the human being. We enter into nature at birth, but we are also more than nature, by virtue of the spiritual forces that we develop through our repeating earth lives. From the perspective of the spiritual world, when we are born on earth we leave our origin and “die” into the physical world. Here on earth, we live as spiritual beings within the world of matter. In this dimension, spirit has been condensed into substance, into matter, and surrounds us as the natural world. Here, the laws of cause-and-effect, of material logic, of cold and hard facts hold sway. Death can only be overcome when the material world can be permeated by life. Etheric, or “qi” forces, such as unfold in the plant kingdom, cause the world of nature to flourish. Where sentience and spirit conscious are also active in these living-material bodies, they become vehicles for the evolution of consciousness. We carry death in our bones, life in our etheric (qi) body, and the sensations and feelings stimulated through our senses. As evolving I-conscious beings we find our homes in these earth-bodies, woven out of these substances of spirit/matter. And to the extent that we are “well-incarnated,” we can use our bodies to fulfill our biographies healthily on earth. In Capricorn the mysteries of the physical, material world are shown in their extreme. This is the season to contemplate how, as infants, we begin our existence here on earth in a passive, receptive state. In a state of pure receptivity, we live our way this world of light and color and sound and texture, even as we are fed and warmed by the gifts of creation. Yet we are not meant to remain as passive consumers of creation. We are not merely creatures of the natural world, and we need not blindly follow our greed, passions and instincts. Maturing towards adulthood, we unfold our thinking, feeling and willing forces. Gradually, we awaken, becoming aware of the virtually limitless possibilities of our spiritual consciousness. In truth, we have an absolutely essential role to play in the evolution of the world, for we hold the keys to advance the earth or to destroy it. Our thoughts, our feeling and our free deeds are all essential for the creation of the new world, even as the old world passes away. When we become inwardly active enough to notice the activity of our own self-awareness, we become aware of our own role in this universe. Through our humanity, we affect the world even as it impacts us. And by learning to discern the original archetypes of creation, we can choose to act in harmony with the original moral forces. Acting out of them, we can create a future worthy of the gift of life we have been given. Once we have witnessed the sacred power of the human heart and mind, we are astounded to what extent the human being harbors the forces that will build the future of our world. The human body, woven as it is out of the same forces as the world of nature, is in truth a sacred temple for the spirit. The infinite potential of the human spirit has been laid, seed-like, into this sacred temple. Evolving through lifetimes in this so-called world of death, we all must pass through the trials of existence, as we unfold into freedom and live our lives in love. Although it is an earth sign, Capricorn carries the deepest possible power of new life. Capricorn teaches us how we “die” into the material world, there to awaken in the power of the depths. We learn how our spirit can take hold of the world of matter and lead it into what is known as trans-substantiation. The awakened human being participates in the resurrection of matter and the creation of the future of the universe. Between lifetimes on earth, we exist spread out into the infinite periphery of the spiritual world. Here, in our earth bodies, we have been compressed into the smallest possible “point” of the center of the world. Our existence pendels constantly between point and periphery, in our repeating cycles of birth, death and rebirth. On a microcosmic level, this dynamic is also imprinted upon the body. Our head represents the “point,” and the limbs stretch into the “periphery,” while the dynamic middle lives in the rhythms of the heart and lungs. Ruled by Saturn, Capricorn forces are found in all the bones of the body. More specifically, Capricorn rules the joints of the body, represented archetypally by the knees. The joints of all the limbs are made up of a ball at the end of one bone and a socket at the end of a second. These represent the dynamic balance between the periphery and the center. Capricorn in the joints enables our will to be flexible and adaptable. Consider for a moment how your limbs would be if they had no joints: it would be virtually impossible to move! Capricorn, thus grants buoyancy to our existence in the world of matter. The mythological animal connected to Capricorn is the sea-goat, a strange figure with the head of a goat and the curved tail of a fish. It is also sometimes described as a mountain goat, a creature of the flatlands who has evolved to survive on the highest peaks of rugged mountains. We need to understand the forces of Capricorn as creating a bridge between the heights and the depths, even as the sea-goat lives in the mountains and in the oceans. In the gesture for eurythmy, we practice feeling how the forces of the mind, of thinking (represented by the goat who lives in the heights), are used to guide and direct the actions of the will (represented by the fish who lives in the depths). In the gesture for Capricorn, the left hand indicates the head forces. We make a fist with the left hand and place it on the forehead, indicating and intensifying the feeling of the rounded head. The right arm extends outward, representing the will. We hold the right arm straight in front of us, palm facing outwards. We take a large step forward with the right leg, and a somewhat smaller step with the left leg, and, bending the legs, intensify the feeling of the lower will. Remembering the power of Capricorn in the joints, pay special attention to the power of the knees. The consonant that corresponds to Capricorn is “L,” the sound of life, of light, of transformation. The colors of L are soft lilac, silver gray and quietly glowing orange. The sound L is found in some of the most beautiful words of language, including light, love and life. The L speaks of transformation and illumination. It speaks of how the forces of death and darkness that have descended into the realm of earth are transformed back to spirit union, feeling love and affirming light. L is found in everything that moves through death and life. Its gesture guides the changing of the seasons, the cycles of evaporation and precipitation, the flow of fluids passing through plant life, and the cycles of dying and becoming. No death is too dark, no destruction so great that the forces of Spirit cannot reach into them and transform them. L changes darkness into light, destruction into love, death into life. Thus, through L I engage the force of life that will bring rejuvenation to all that is stagnant within and around me. Begin by feeling yourself clothed in silver gray, surrounded by a gentle lilac-colored field of life. You are poised between polarities, between the endless cycle of life and death, matter and spirit, metamorphosis and transformation accompanying life. With golden-orange lightness in your joints and muscles, begin by lifting your arms to the sides with your palms down, sensing an imaginary horizon line between gravity below and light above. With rounded arms, curve your arms downwards and reach into the depths, bringing your hands together in front of you. When you have reached the lowest point, allow the forces of levity, the force of counter-gravity to raise your arms. Hold your hands side by side as you let your arms be lifted almost weightlessly in front of you. (Take care that your hands point downwards as you lift them, and keep them close together without crossing them as they pass the horizon lines and rise further to the zenith.) 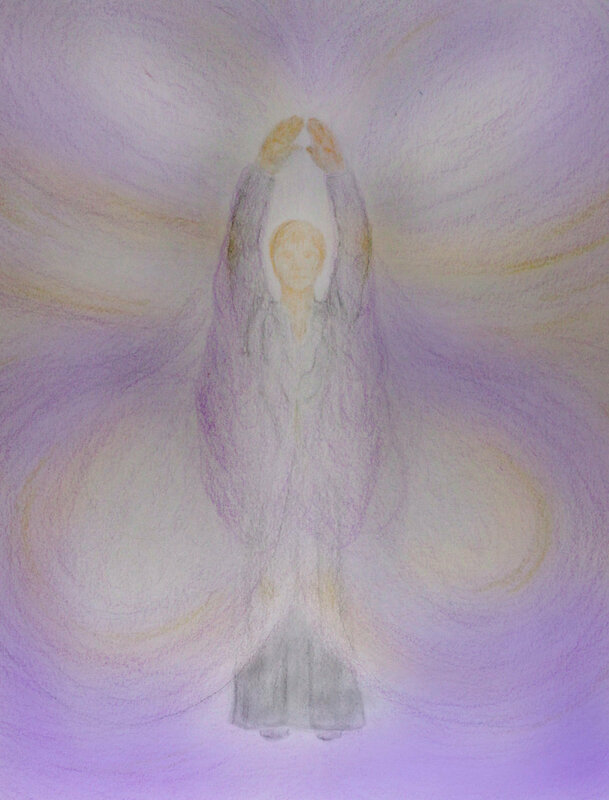 Rotate your palms at the very top of your ascent so that they face upwards, blossom-like, as you open your arms wide like a great rainbow arch above your head, and let the colors flood the space above you as your arms sink lightly to the horizon. Creating a new L, turn your palms downwards once again and reach into the depths again, entering a new cycle of metamorphosis. Now explore the many wonderful pictures that come alive when you work with L.
Imagine that you plant a small seed into the ground, and let its roots grow deep. Let life rise through the stem, until the blossom unfolds into a wonderful flower. The new seeds will then sink into the earth and the cycle will begin again. Or imagine the water that flows like a river through a mighty tree. The water sinks deep into the roots of the tree, rises through the great trunk, and unfolds in a majestic crown. Or then again, think of the greater cycles of water, going deep into the earth and then rising through evaporation into the clouds, falling like rain, only then to go deep again and again. On a more personal level, you can discover how you enter with your feeling into realms of darkness and transform them into light. Through L, you transform death into life. Through L, you transform hate into love.